Genevieve Bogdanowicz snoozes blissfully on a recent sunny afternoon, unaware of how she came into the world seven days earlier. 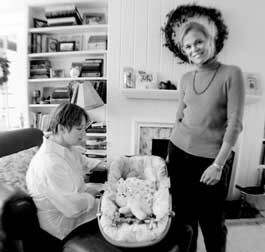 Her mom, Joanne Beaubien of Burlington, decided to rely on the services of a doula: Sally MacFadyen eased the way before, during and after the February 13 birth of Beaubiens daughter. Although it sounds exotic, the Greek word doula is the equivalent of labor assistant or labor companion, despite the fact that practitioners tend to be involved with each expectant client for several months. Whether in a hospital or home birth, doctors and midwives are responsible for delivering an infant and handling all medical issues; a doula focuses primarily on the mothers well-being throughout the entire process. It can be a demanding profession. The grassroots notion of doulas is regaining popularity in an era when taking charge of your own health has become a mantra. Two national organizations, Doulas of North America and the Association of Labor Assistants and Childbirth Educators, or ALACE, assess on-the-job training in their certification programs. Doulas attend workshops, but largely learn by reading and simply doing. Beaubien was also anxious to avoid another Caesarian section, a necessity with Adam. The couple met with MacFadyen midway through the second pregnancy. They took some of the birthing classes she offered and called her whenever they had any concerns. A few days before the big event, Beaubien was bothered by leg cramps late at night. She called her doula, who advised taking a hot bath. Things calmed down. It saved Joanne a trip to the hospital, surmises 36-year-old MacFadyen, a Burlington resident and former elementary school teacher who founded the BirthCare Collective with three other doulas. Beaubien and Bogdanowicz raced to the hospital, trying to avoid the speed bumps, she remembers with a laugh. It was a whirlwind, adds MacFadyen. But the doctor determined that a vaginal birth would be problematic, due to the babys position, and recommended another Caesarian. My role was to help Joanne change gears, MacFadyen says. To tackle that period of mourning, seven days later MacFadyen is recounting details of the birth in a postpartum session with her client. The thoughtful doula has brought along sandwiches and bags of chips. In addition, shes experiencing some trouble with the way Genevieve latches on when nursing. A good latch means the mothers comfortable and the babys satisfied, says MacFadyen, who has also worked as a lactation consultant. Studies have demonstrated that fewer complications occur when a womans emotional and psycho-social needs are met during childbirth, says Gwyneth Carsten, a newcomer to doulaism who has attended four births in the last year. An ALACE brochure cites statistics that show significant decreases in Caesarians, length of labor, use of forceps and pain medication, among other possible consequences, in a controlled trial of more than 1000 women aided by doulas. Another doula had been on hand for the birth of her first child five years ago, when Walp was a single mother. But as a married woman, she was initially wary about approaching Carsten. I thought shed be stepping on my husbands feet, she explains.